It’s that time of year again to think pink. Pink foods, pink clothes and pink convertibles. Maybe a pink car is too much, unless it’s a Caddy and you’re hocking Mary Kay. But really, anything pink that helps raise awareness of breast cancer. Even something as simple as these little cake mix cookies that can be made in a snap. These are perfect for sharing with friends and family at school, work or church. This July, Susan G. Komen® and KitchenAid are partnering again for 1,000 Cooks for the Cure, a program that aims to enlist 1,000 cooks from the U.S. to host a get-together with friends, family or colleagues anytime from July 18-27, 2014. In lieu of a host gift, guests are encouraged to bring a donation in any amount to support the fight against breast cancer. Visit Cook for the Cure for more information on the Cook for the Cure program. 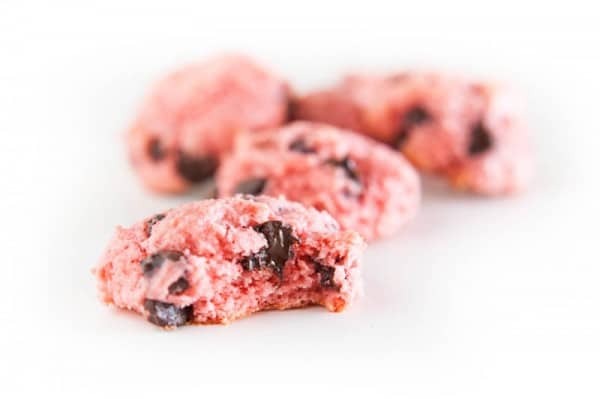 For these cookies, I used a box of pink velvet cake mix and added some chocolate chips along with a little butter, oil and an egg. I love how easy and pretty these cookies are. I’ve taken these cookies to share with friends before, and they’ve always been such a big hit. Everyone loves how soft and delicate they are, and no one ever believes they’re as simple as a box of cake mix! 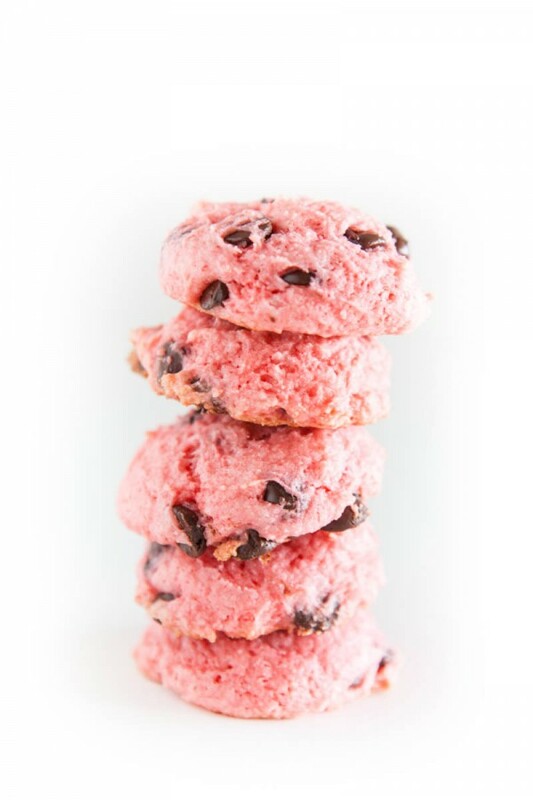 To find more inspiration for pink foods, check out the Cook for the Cure Pinterest Board. It’s filled with great recipes, decorating ideas and party tips. Be sure to also stop by the Kitchenthusiast blog for some incredible and unique recipes. Heat oven to 350°. Combine strawberry cake mix, egg, butter and milk in a large bowl. Mix well to combine. Fold in chocolate chips. First, be sure to head over to Cook for the Cure and register your get together now! 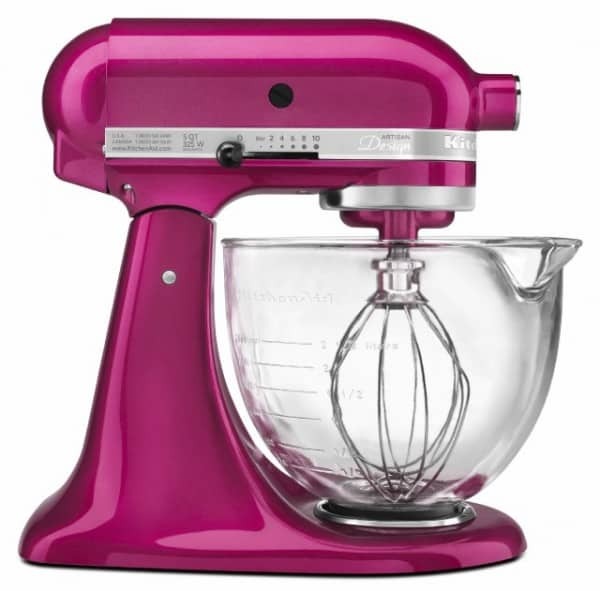 After that, come back to enter to win this fabulous Raspberry Ice KitchenAid Stand Mixer (5 quart tilt head stand mixer with glass bowl, ERV $459.99)! The model number for the mixer to be given away is: KSM155GBRI. This giveaway sponsored by KitchenAid. All opinions 100% mine. I have not been affected but I know many people have gone through this awful thing. My husband’s aunt died from breast cancer, leaving behind two small children. Life is so precious. My best friend’s mom won her battle against breast cancer. My best friend’s daughter lost her battle to breast cancer. I’m a 26 year old 1 year survivor of breast cancer! My friends and I are so grateful for all of the support and help finding the cure! Breast cancer took my mom. I do all I can to help the cause. my aunt passed away from breast cancer. i try to support the cause any way i can. One of my dear friends is a cancer survivor. I don’t know anyone personally but I like hearing stories of people being open about their experience so other people who have been affected by it feel like they have support out there. My grandma suffered from breast cancer but she underwent chemo and is now a 10 year survivor!!! I lost my grandmother 30 years ago this month after her 4 year long battle with breast cancer. She was only 65 years old. I was devastated. She was very special to me. Our birthdays were less than a week apart and for the first 15 years of my life, we always celebrated them together. My grandma died less than 3 months before my sweet 16. She had already bought my birthday presents and that was the hardest day of my life when my parents gave me her birthday presents to me. One of those presents was a necklace she had made for me out of her diamond engagement ring and her pearl earrings. It’s beautiful and I treasure it. I have no children of my own, so one day it will go to my oldest niece. Thanks to foundations like Susan G. Komen and projects like Cook for the Cure, the treatment of breast cancer has grown leaps and bounds. I wish so badly we’d had the information we have now back when my grandma was diagnosed, but thankfully, hopefully and prayerfully, lives today will be saved because of it. Possibly even the lives of my mother, sister, and nieces. Thank you so much for this very special and awesome giveaway opportunity. Thank you for helping to raise awareness! I have several family members and friends who are breast cancer survivors. Fortunately breast cancer has not yet touched my life but I know the odds are that it will. I am very grateful that we have not faced breast cancer. However, my mother died of cervical cancer. Devastating. I haven’t had a personal encounter with breast cancer, but I like hearing women’s stories who have survived it. I am thankful that no one in my family has been diagnosed with breast cancer but I do know woman (coworkers, classmates, and clients) that have suffered from breast cancer. 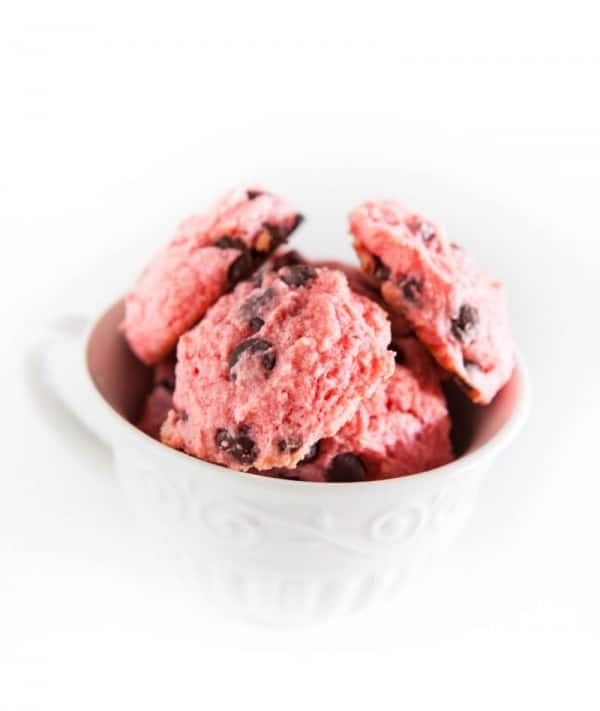 I think it’s wonderful that Susan G. Komen®, KitchenAid, & Eclectic Recipes have partnered to raise awareness and funds to support the fight against breast cancer. I look forward to trying the recipe & the Raspberry Ice mixer is beautiful. Crossing my fingers. Breast cancer is so near and dear to me. My grandmother is a survivor and such a strong woman!